The holidays are here, and everything seems to take up too much time. Making dessert should be fast and simple. Whip up this super delicious recipe in no time! ½ tsp Amoretti® Vanilla Madagascar Bourbon 20X W.S. Peel pears, core and cut in half. Pour Blue Agave Nectar and Pear Compound into a large saucepan. Place pears flat side down in saucepan. Fold parchment paper in half and then in half again. Cut corner, and then cut small triangles along sides (see video). Unfold and lay parchment on top of pears. Cook on medium heat for 8-10 min. Turn pears over and cook for another 8-10 min. Pears are done when a knife slides in with some resistance. They will continue to cook once removed from heat. Let sit in agave for about 5 min. Remove with slotted spoon, being careful not to damage pears, and set on a plate to cool. Whip crème fraiche, sugar and Madagascar Bourbon Vanilla to soft peaks. Heat about 2″ oil in small saucepan to 350°F. Drop mint leaves into oil and fry for about 10-15 seconds. Lift leaves with “spider” or slotted spoon and place on several layers of paper towels to drain. Whip cream to very soft peaks, almost runny. Fold in Crema di Caramel™ Syrup. 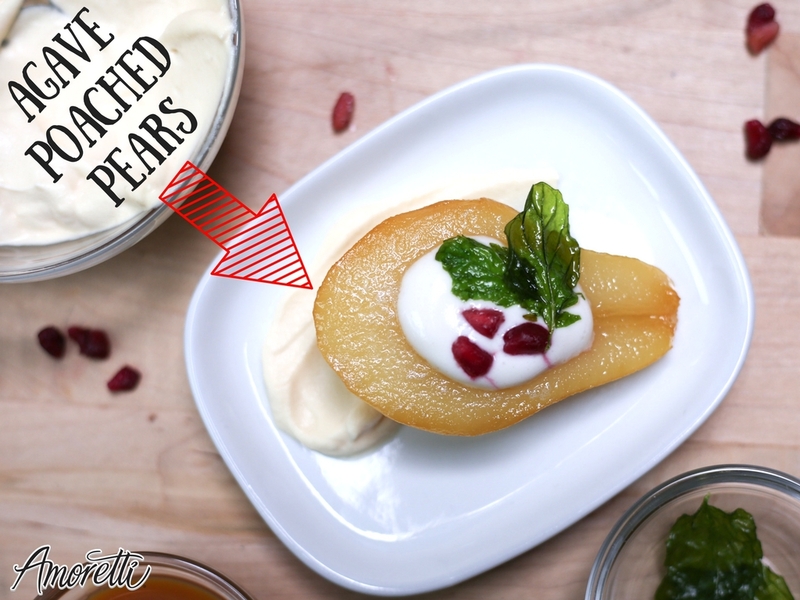 Place one pear half on each plate and garnish with whipped crème fraîche, a drizzle of Crema di Caramel™ Syrup, cream mixture, and a fried mint leaf.